Most of the explosives and blasting agents sold in the US are used in mining. There are two classifications of explosives and blasting agents. High explosives include permissibles and other high explosives. Permissibles are explosives that the Mine Safety and Health Administration approved. Blasting Agents and Oxidizers include ammonium nitrate-fuel oil (ANFO) mixtures, regardless of density; slurries, water gels, or emulsions; ANFO blends containing slurries, water gels, or emulsions; and ammonium nitrate in prilled, grained, or liquor form. Bulk and packaged forms of these materials are contained in this category. In 1998, about 95% of the total blasting agents and oxidizer were in bulk form. The principle distinction between high explosives and blasting agents is their sensitivity to initiation. High explosives are cap sensitive, whereas blasting agents are not. Many coal mines use explosives to loosen the rock and coal. In surface mining, holes are drilled through the overburden, loaded with explosives, and discharged, shattering the rock in the overburden. In one underground mining method, the coal is blasted off the bed without any undercutting to help break it down. The drawback to this method is that a dangerously large explosive charge is needed, and much dust and fine coal are produced. In another underground mining method using explosives to break down the coal, shot holes are drilled at intervals along the face of the coal bed. The explosives are inserted in these holes or shots. When the explosion occurs, the coal wall cracks into pieces. Coal mines use cylinders of compressed air, liquid carbon dioxide, or chemical explosives. Approximately 1.72 million metric tons (Mt) of explosives used for coal mining in 2000. This accounted for 67 percent of total U.S. explosives consumption. The largest coal producing states, Wyoming, West Virginia, and Kentucky were also the largest explosives-consuming states, accounting for 41 percent of total U.S. explosive sales. Quarrying and nonmetal mining, the second-largest explosives-consuming industries, accounted for 14 percent of total explosives sales and metal mining accounted for 9 percent. Kentucky, Wyoming, West Virginia, Virginia, and Indiana, in descending order, were the largest consuming states, with a combined total of 51 percent of total US sales of explosives. Explosive casting is the technique used by many surface coal mines to control the displacement of overburden by means of explosive energy. The casting moves 30-80% of the overburden into the mined-out pit, while the remaining spoil is removed by draglines or other machinery. A blasting engineer must consider bench height, pit width, borehole diameter, and geologic formation when designing a cast blast. In most cases, the blaster uses a complicated sequence of downhole and surface delays to minimize the ground roll associated with the large amounts of explosives (between 0.5-8 million pounds, ie, 500 to 4,000 tons, of Ammonium Nitrate Fuel Oil ANFO) used in a cast blast. The casting of the overburden into the pit creates both horizontal and vertical spall force components that influence the generation of surface waves. Kiloton class mine blasts are not uncommon in numerous regions worldwide such as Wyoming, Kentucky and, at least historically, the Kuzbass mining region in Russia. These use delay-firing and thus a considerable explosive yield is spread out over several seconds and seismic amplitudes are reduced. It is well known that minor deviations from the planned shot pattern are obiquitous. A small subset of these events, however, include a significant detonation anomaly. The majority of hard rock open-pit mines design blasts that will optimize the insitu fragmentation of the material. This is accomplished by loading the holes with two different energy levels: higher energy explosives in the bottom and lower energy near the top. The result is that the material is not thrown into the mined-out pit as in the cast blasts. Instead, the material is fractured in place and removed with shovels and haul trucks. Seismic waves generated from a fragmentation blast should be influenced only by the explosion point and vertical component spall forces. A third type of explosion used in the mining industry is for quarrying materials such as limestone, gravels, and igneous rocks. On average, quarry blasts are smaller in spatial extent and explosives content than fragmentation and cast blasts. Since these operations usually involve the crushing of the rock, efficient fragmentation of the rock into small pieces is required for use in a rock crusher. 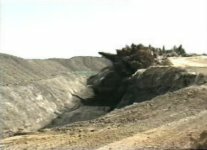 For ease in extraction of the materials, the rocks are usually blasted into the mined-out pit. Quarrry blasts seismograms will thus have both horizontal and vertical spall forces effecting the regional seismograms. When the eject angle is 0°, there is no horizontal spall component and the blast is analogous to a fragmentation shot. For quarry blasts, there is some material cast into the pit at eject angles greater than 45°, however, a additional amount of the spalled material is cast into the air at angles between 0 and 30°. Finally, for cast blasts, the majority of the material is ejected at angles greater than 30°. Cast blasts will have the largest deviation from an isotropic source (i.e., a fragmentation blast) with the magnitude of the azimuthal variations being dependent upon the eject angle. In all cases, there is a slight increase in the amplitudes in the direction of the delay-firing. For the cast blasts to take on a more di-polar ("peanut-shaped") radiation pattern, the mass of the horizontal spall must be increased. By adding additional rows of explosives with different interrow and interhole delays, the characteristics can become markedly different.